Guess I shouldn’t have made that the title of the post, so you get that answer, before how I got there. The problem, genealogical question, is Where is the 120 Acre Farm, owned by this Civil War Soldier? Before I get there, what I learned is, not only have another set of eyes look at the problem and where you are, but another discipline set of eyes. What I learned is that a person at a Historical Society might approach a problem (or Genealogical Question) from a different angle. I had been emailing two members of the Washington Township Historical Society and their approach was certainly different. One program that they offer, at least once a year, is a Historical House Tour. So, they might use Deeds far more than I would or have. They know where to look. Very helpful hints. Today, I knew that some one was going to be at the Museum so I stopped by to see what else I might find. I had mentioned that the father of my soldier “rented the Dufford farm”, from a reference book they had in their collection. I was presented with a 2” wide box for that surname, as there is a local family organization in the area, as the family has been around for a very long time. While I was looking through that collection, another person went to look at maps. A similar map from want I had been looking at. Much clearer, but know knows the historic area better than I, but I heard “I found something”. There is was … all I can say …. “spelling doesn’t count”. Who would have looked at Woertz, when I was looking for Ort, on the map. I had seen that on the map, but had not oriented by mind to where that was in reality. Now, I had found my Civil War Soldier’s family with a street name, so I knew where the property was from the Census Record. The Map showed the same location. I had done the Census, back a page or two, forward a page or two, so I knew the neighbors. The bad part of that is, the combination of names are very similar around the township. The 1880 Census was my next stop (again). Across the street on the map, very nicely shows D. Dufford, as does the Census. A different set of eyes, different way to research, AND “Spelling doesn’t count”, helped me identify the 120 Farm that was talked about in that Pension File. Thanks to the Washington Township Historical Society for helping resolve this Genealogical Question. Over the weekend, I listened to the Board of Certified Genealogists / Legacy Family Tree Webinar series. Great job to the presenters and a Thank you to Legacy Family Tree Webinar for making these recording available. The point that I picked up on, was that we can, at some point in time, put one of our time consuming, reasonably exhaustive research (or search) aside. 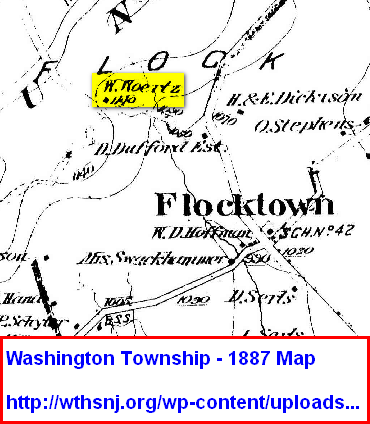 That was important because I have been spending a lot of time trying to determine how this Post Office indication, in this 1870 Census record played a role in locating this farm. Was it an important “issue” to walk away from. Not willing to just walk away from it, I took one more try. I went to another website, in this case FamilySearch.org to see what I could find there. Went to their Wiki and located their Census Records. I wanted to look at the same data, but from a different angle. It was easy to locate the Township Census Records, found what I was looking for and went to the First Page for the township. Sure enough the same Post Office. Went to the last page, same Post Office. Because of the way this website presented the data, I thought about the notion of a page or two before you entry, and a page or two after your entry. Just did that for my township. What about the neighboring township? Sure enough, I finally found my “permission” to put this “issue aside. The next township also had the SAME Post Office on all of it’s pages. No impact there. So, the Post Office issue, for the 1870 Census is off of my plate. Thanks Judy. 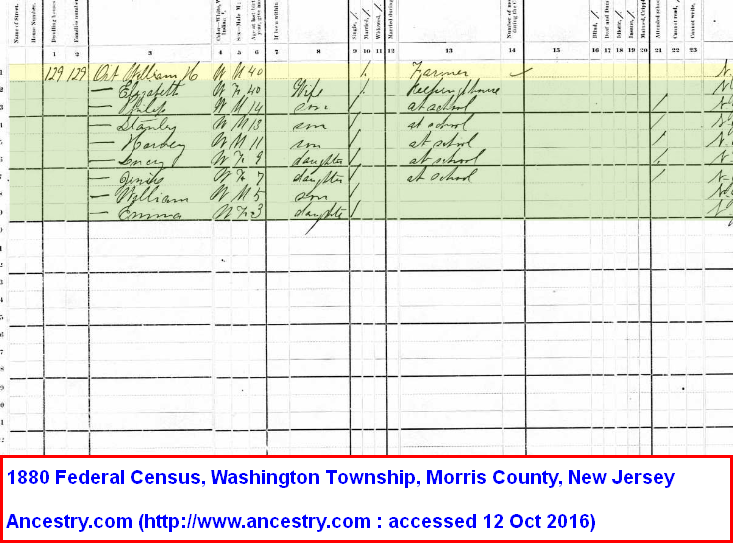 Before “this chapter” is closed, I am in the process of going page by page (image by image) through that 1870 Census, to locate all of the households for the family I am searching for. The earlier Map I share before clearly showed that at least two farms had the right names associated to the property. Now can I find them on the image. So far, using the usual search hasn’t found them, but if I browse the images, I may find what I am looking for. My current thinking is that if the Civil War widow is asking for an increase in her Pension, specifically mentioned 120 acres of land, in 1907, I should be able to find that farm. One more bit of information. I found another map that had the farm owners name AND the acreage and year of purchase of that property. Not, the farm wasn’t listed there either. Back to the Historical Society, but with new questions. I decided to put some data into a time line so see what that might show me. Here is a time line of what I found about the Post Offices that appeared in the Pension file. I have started a spreadsheet to help be catalog the 126 pages of pension files. For this pass, the only concern that I had was to capture dates and Post Office names. I have a few notes to go back to, but trying to see of the Date and Post Office would tell me anything. 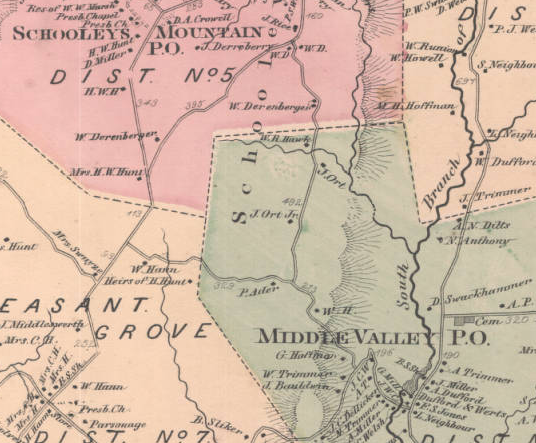 From the Pension file, Schooleys Mountain was the Post Office in the file from 1870 until 1907. That would indicate that they were living “on the mountain”. 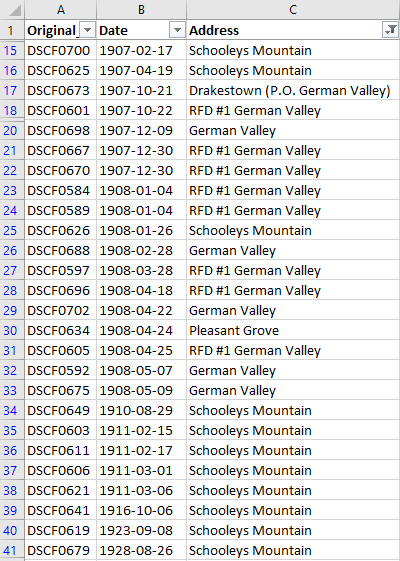 As you can see, 1907 and 1908 the Post Office changed to German Valley (the post office in “the valley”). Then, in 1910 returned to Schooleys Mountain. So, something happened in 1907, right? Well, the Civil War Soldier, died 21 Oct 1907, so it appears that the Widow relocated to “the valley” with family. Several of the documents in 1908 talked specifically about 120 Acres that she had. The 1900 Census shows that my Civil War Soldier was on “the mountain” with his wife and 4 children. I know where that property is located. The youngest son, would purchase a farm “in the valley” in 1916 (our 100th anniversary farm). But, the widow, returned to “the mountain”. Why did she go back up “the mountain”? Could it be that a grandson still owned the farm on “the mountain” after he purchased the farm “in the valley” ? There was still family about where I think the farm is located today in the 1940 Census. Could that be the 120 Acre Farm? But, why the 1870 Census Post Office being 22 miles away, with other Post Offices still active at the time. Back to the Historical Society, for another look at their information on the Post Office and to see if they have any other Maps. I have already reviews the Online Maps, but before the 1900’s. They may also have access to or can point me to, Deeds for the Property that I know about, and to the size of that Farm. I recently received a Civil War Pension file, indicating that the Soldier and his wife (after his death) owned 100+ acres of land. The letters in the file had the suspected post offices mentioned. 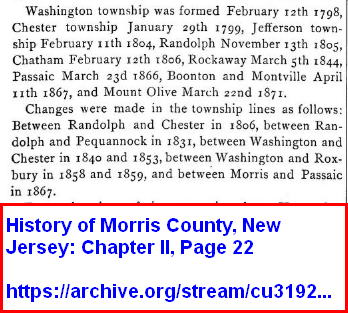 I know, from census records, that the family had property as early at 1860 in Washington Township, Morris County, New Jersey. It wasn’t really a question of the township, but where in the township. Later census records were very clear where the farms were, including the current farm, celebrating 100 years at the current location. I can also go back to the next previous farm, also in the township. In this area, one my say “in the valley” and “on the mountain”. A visit to a local Archive was in order. 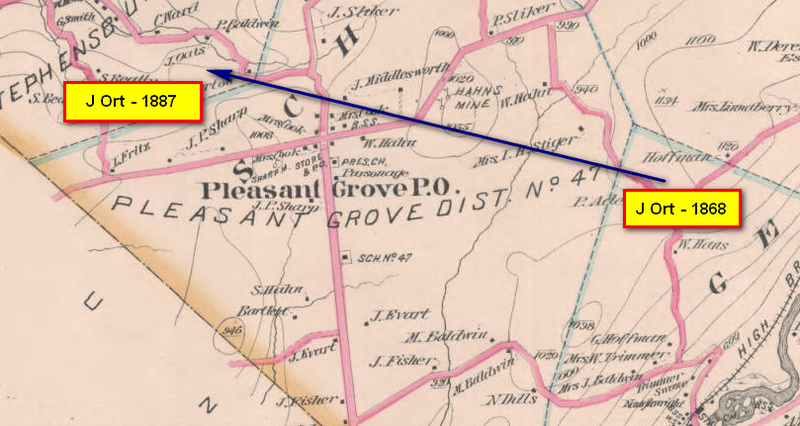 The Archivist very nicely pointed me to where some old County Maps were located, and found an 1868 Map, that had the Civil War soldier’s father and sibling mentioned on the map. Overlaying that map with Google Maps, I knew where the farm would have been. I drove to where I thought it was, and in fact, it is still a farm. All of the bends in the road were as they should be, the stream was where it should be, present day and that 1868 map. BUT, where was my Civil War Soldier. Certainly a 100 acre map would have some indication on that map. I went back to the Census Records, reread my citation, and noticed something really weird. The 1870 Census has a Post Office name listed. The Post Office in Succasunna, NJ, and the Census says Township of Washington. Clearly, there is a problem here. Succasunna is NOT in Washington Township. Succasunna is in the next township. Also, that was also one of the post office names in the Pension File. Next stop, the Washington Township Historical Society. As it turns out, the person I spoke with knew exactly what I was talking about. The 1870 Census. She ready knew my question, where did Succassunna come from for that census record. She had some information on the Post Offices in the township over time. Someone had already done research on them showing that they opened and closed over the years as the township grew. I went back to verify my Census Records (image above) to make sure I didn’t miss anything. I did my usual back a couple of pages in the Census, forward a couple of pages. Many familiar and sometimes family names were listed, as expected in Washington Township, not in Roxbury Township, where Succasunna is located. Well, if Post Offices opened and closed, there has to be a history of that. In fact I had looked for this before, but for Post Masters, not Post Offices. The notion in my mind was that the Washington Township Post Offices had closed or that the family was closer to this post office then ones on the other side / end of the township. I did find a listing for Post Offices in New Jersey, and had dates that they were in “business”. Well, the Succasunna Post Office, didn’t open until 1888. BUT, in looking at that map again, besides Succasunna there was also “Suckasunny” (1808-1888). OK, my usual “spelling doesn’t count” clicked in. 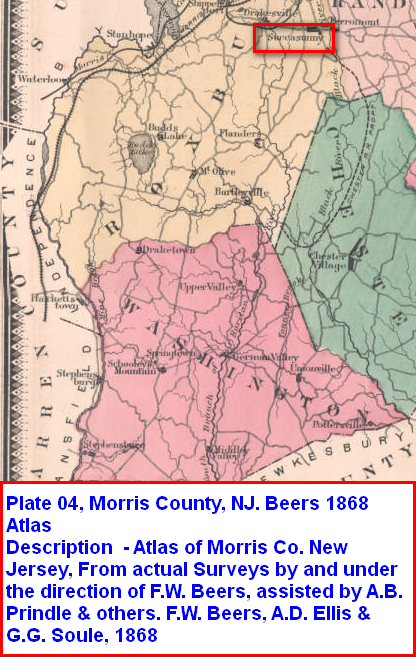 So, I am confused, as well as the folk at the historical society, about the 1870 Census with a Post Office listed in the next township. and trying to see which of the 8 or 9 Post Offices that have existed in Washington Township might have been closed in 1870 to have the Census bureau use the neighboring township. Oh, and it’s not that close. The other problem here, is that Enumeration Districts had not been established, from what I can tell for the 1870 Census. I know that I am missing something here, but am not sure what that is. With a 100 acre farm, I should be able to find it on one of these historic maps. 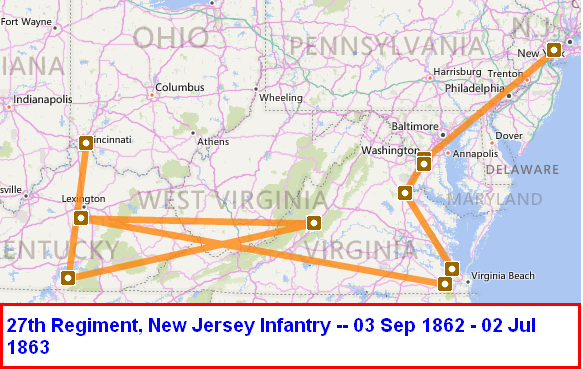 I have seen the 1868 map and a 1878 map and have located the father Jacob but not my Civil War soldier. Am heading back to read the Civil War Pension file to see if there is a hint that I missed. I’ll pay closer attention to the Date and Post Office mentioned in the 125+ pages in that file, to see where this farm is. I have been a contributor for the Find A Grave website for a long time. Posted Memorials, taken photographs, and used it as a research tool. I have used the Find A Grave APP since it first came out (in Beta) years ago. Always on my smart phone. But, last fall I purchased a “Blue Tooth” enabled vehicle. I am currently working on a research project that I have talked about here of late. Needless to say, this local family is in many local cemeteries. I know where most of them are already but I was challenged with a cemetery that I hadn’t visited before. 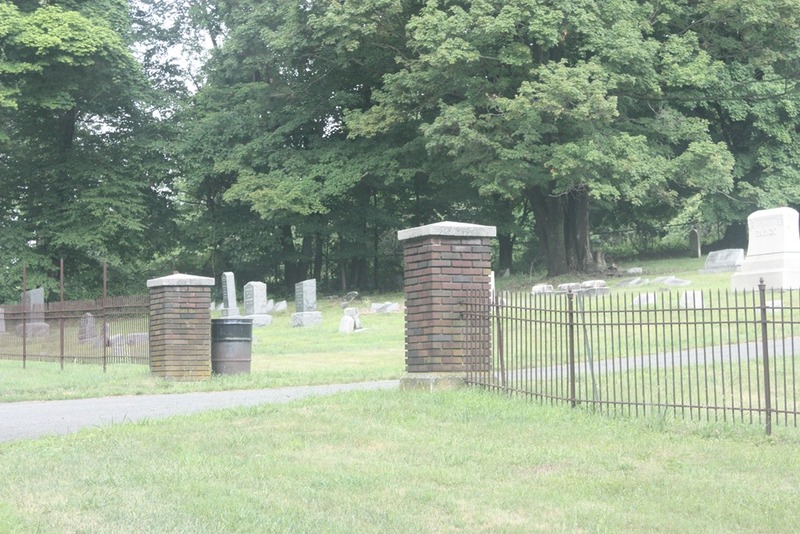 The Find A Grave website did not have an address, only a town and county name. Not helpful. I had visited two cemeteries and really wanted to visit this third one. As is my custom, I get as much information as possible before I ‘hit the road’, and this was no exception. I thought I knew about where the cemetery was, knew were several others are in the area, but I just couldn’t find this one. I stopped driving about about an hour earlier than I would have in the past and thought, why not use the Find A Grave APP, on my Blue Tooth enabled radio. Pulled up the Find A Grave App, went to the Map, which showed the Cemeteries “in the area” and there was the listing I had seen on the website. I noticed that I could get directions from the APP. It uses Google Maps and started to talk to my mode of transportation. I followed the voice’s instructions, right up to the front gate of the Cemetery (without any signs with the Cemetery Name). No wonder I didn’t know where it was. It wasn’t marked. As the saying goes “There’s an App for that”. You know, a Drip under Pressure. That’s me, right now. You may see this image a couple of more times over the next couple of months. It appears that the Century mark (100 years) has finally set in for me. 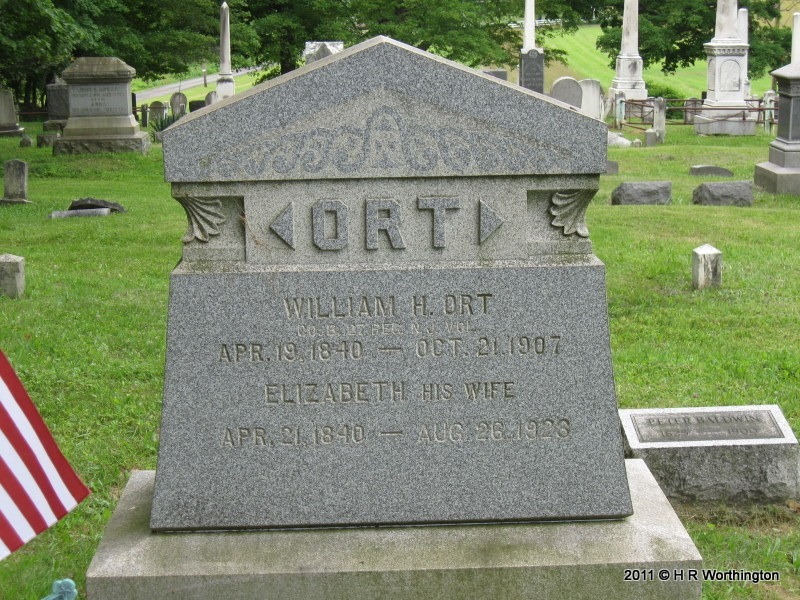 First, both of my parents were born in 1916, as was the FIRST Ort Farm in Long Valley, New Jersey. 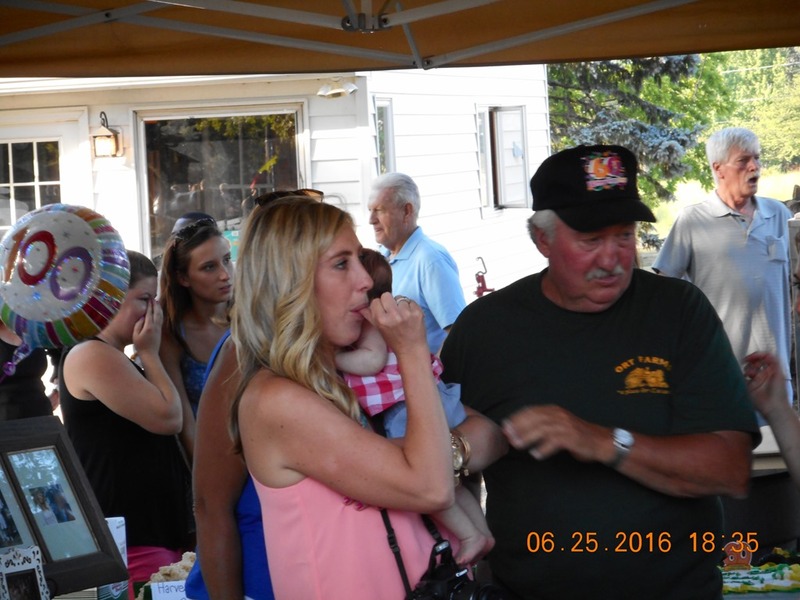 This past Saturday, Ort Farms had a “Friends and Family” Picnic and a Birthday party. As daughter Jenn has been working for the farm for about 10 years, we were invited. 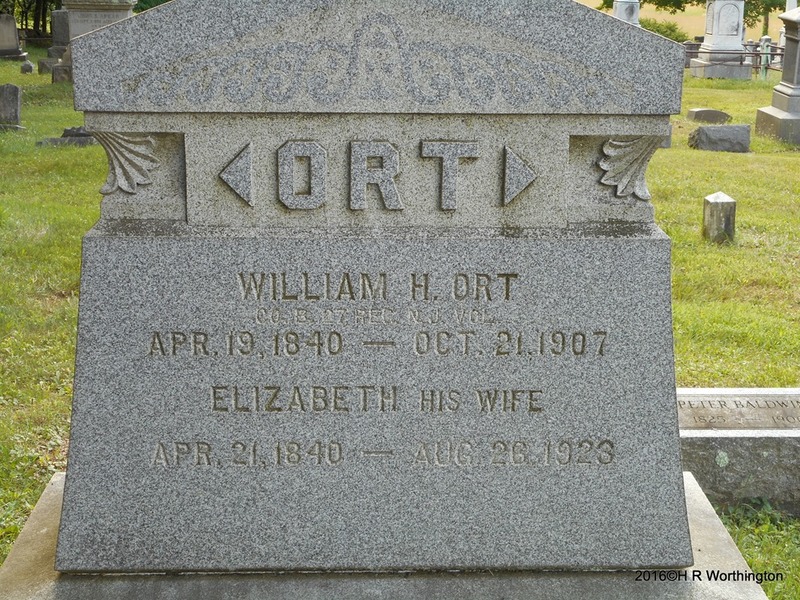 At the party, there were at least 4 generations of Ort’s and related family there. As expected, a small table with some pictures, new and old. A couple of family photos, a picture book and one “in progress”. One of the photos was of all of the Grandchildren who work on the farm, even today. I can see “been there, done that”, in that I do remember the farm gatherings, both Family and Friends as well as other Picnic of other Farmers, Orchard growers mostly, where we would go to a farm and have picnic, like this, EXCEPT not on a Farm that has been in “the valley” for 100 years. When I got home from the picnic, what did I have to do, but see if I can find “Sr” in a Census Record. That story will be told elsewhere, but One search on Ancestry.com gave me enough information to get back to the “first” Ort in Long Valley. The real bonus, HE was a Civil War Soldier. 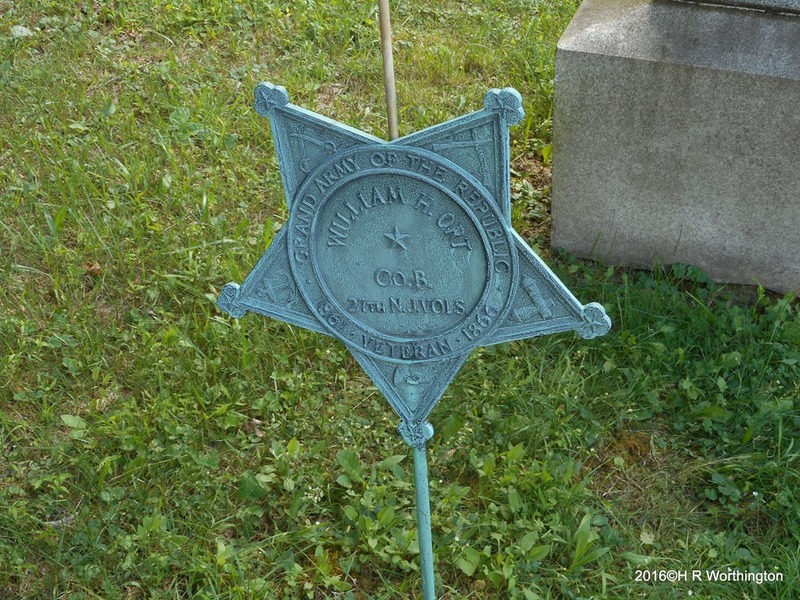 The icing on the cake (couldn’t resist that) was that 5 years ago, I took a photograph of his Headstone AND the Civil War marker. I found a photo of “Sr’s” Father on the Find A Grave website, with a cow. Hmm, a cow on a Produce Farm? Well yeah, there were actually 2 farms. the first being a dairy farm, from what I can tell. Do you see some research that needs to be done ??? Oh, and there IS a Civil War Pension file. DE / NARA here I come. 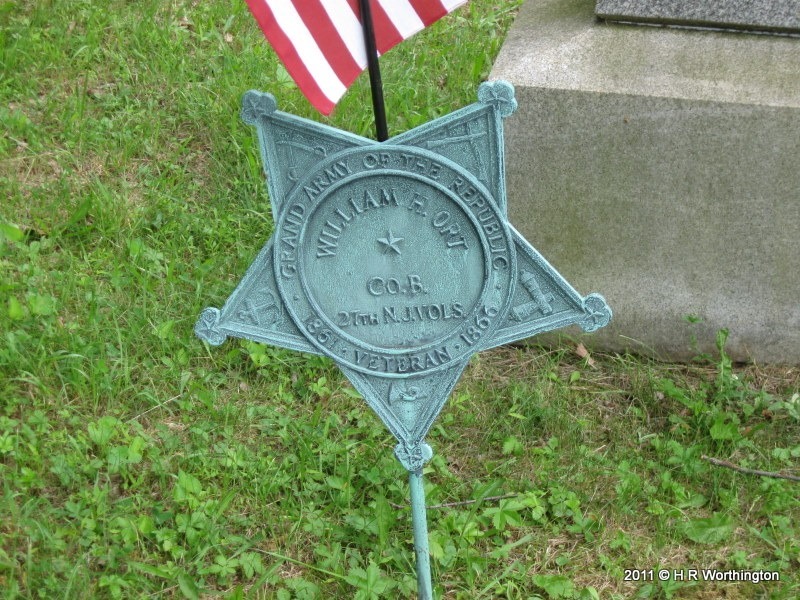 So, I gave my findings to Jenn, that is the history of the 27th Infantry Regiment New Jersey and the two cemetery pictures to see if the family would like me to do some research. So, the pressure comes in a matter of time. 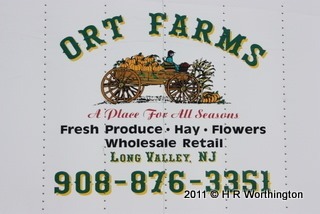 In the fall, is the official, public celebration of the 100th year of Ort Farms in Long Valley. There will be photos, with a little genealogy research thrown in. I suspect that the Washington Township Historical Society will have a couple of visits from me very soon. I guess it’s a good thing I gave a presentation to them a couple of years ago. Hopefully, they’ll let me do a little research on the family. I am sure that have a “ton of stuff”. There is a P.S. here. Like the Ort family farms, the Worthington’s also had two farms. A Dairy Farm and an Orchard. 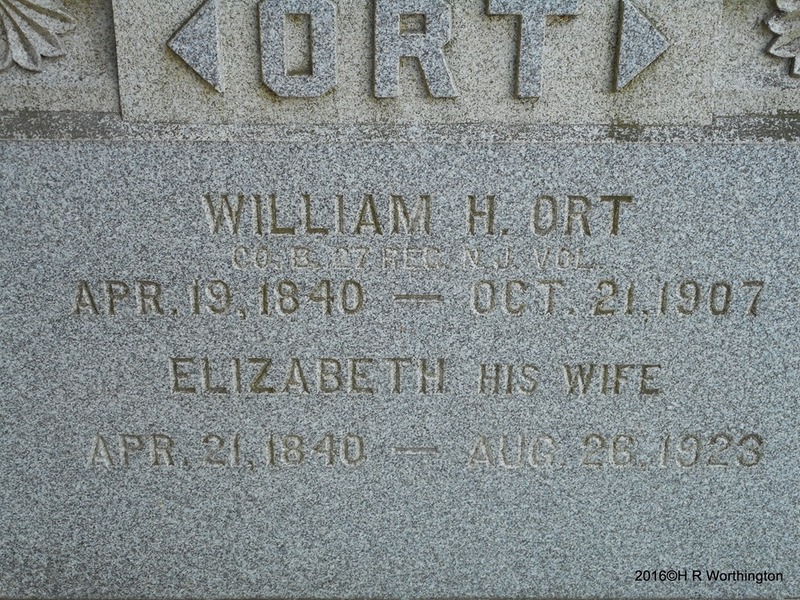 The Ort Civil War soldier has only a middle initial (so far) of H. Jenn said that it was either Henry or Harvey. My dairy farming uncle was a HARVEY, and my Dad (100 years old this year) and his father were both HENRY. You are currently browsing the archives for the Ort Farms category.